What SEC West Players Do You Fear? The SEC is loaded with playmakers and looking at your weekly opponent usually brings at least 1 individual to mind that worries you. The head coach always gets hit with the question about how to stop “player x”. As fans we often worry that this guy will torch us or we have hope that if we shut them down we can win the game. Even the really elite teams usually have a player that drives them. Lets look at the SEC West and see who my picks are that should keep coordinators up at night. Alabama TJ Yeldon- As a freshman he ran for 1108 yards and 12 TD’s averaging 6.33 yards a carry. That’s while splitting time with Eddie Lacy who is now departed for the NFL. Yeldon is a natural with the ball in his hands and could be a Heisman darkhorse candidate especially considering recent RB’s from Bama. You can ask LSU fans about how he can change the course of the game. LSU Jeremy Hill- Another star freshmen RB who was able to rack up 755 yards and 12 TD’s on the ground despite 4 LSU backs getting at least 70 carries. He is so good, 2 of the upperclassmen from last year opted for the NFL draft rather than backing up the young star. Hill is a primed to run through and over SEC defenses again. Texas A&M Johnny Manziel- The Heisman Trophy winner torched defenses for 3,706 passing yards and threw for 26 TD’s in his coming out party. It has been a long offseason of nightmares for defensive coordinators in the SEC. This year will be an interesting challenge for Manziel as every team will throw the kitchen sink at him to try and slow him down. Ole Miss Donte Montcrief- Last year Donte was a hungry fellow and was fed the ball to the tune of 66 receptions, 979 yards, and 10 TD’s. Rebel fans expect more production from the WR attributed to another year in Coach Freeze’s system and a better comfort zone. With a viral music video in his honor, I’m sure Donte and The King Kobraz are ready for a remix. Arkansas Chris Smith- My first defense pick terrorized QB’s from his DE position for 9.5 sacks and 12 QB hurries. He also had 52 total tackles. Smith flirted with the NFL but decided to return to Arkansas for his senior year. He might be the best DE in the SEC not named Clowney. Auburn Tre Mason- Gus Malzahn will bring the high powered offense but is lacking a proven QB and lost a lot of top end talent on defense. I expect the Tigers to lean heavily on the rising junior RB. Last year he amassed 1002 yards on the ground and 8 TD’s. He only had 7 receptions but I also expect that to go up in Malzahn’s system. He will be the guy you game-plan against for Auburn. Mississippi State Tyler Russell- Last year was a good one for Russell where he rewrote MSU passing records throwing for 2897 yards and 24 TD’s. The 5th year senior has all the goods to guide MSU. This year he will be breaking in new WR’s so expect opposing defenses to scheme directly at Tyler. Although the Aaron Murray’s and AJ McCarron’s get more media hype, I fully expect Tyler to make his case as 1 of the best senior signal callers in the SEC. This entry was posted in Sports and tagged Football, SEC. Bookmark the permalink. It was déjà vu again last season when Bama’s backup RB looked a lot better than their starter, and also a Preseason Heisman contender before ever having a starting job. 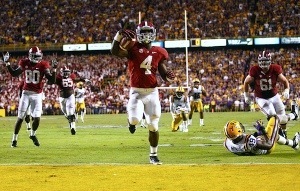 Yeldon is a beast and I think he looks better than Ingram, Richardson, or Lacy ever did at this age.